A pair of real living Holly Trees, which will produce real Holly Berries* - an iconic Christmas decoration. The perfect seasonal decoration for either side of a doorway, porch or gate for a real warm welcome. Comes with a pair of classic gold-effect plastic planters 27cm (11in) diameter to finish off the look. Very hardy and easy to care for they're hardy, evergreen plants and will produce berries reliably each Christmas. Supplied as a pair of standard lollipop form trees, 80-100cm tall inc. pots, plus 2 x 27cm (11in) planters. What could be more perfect this winter than a twist on a Christmas classic? 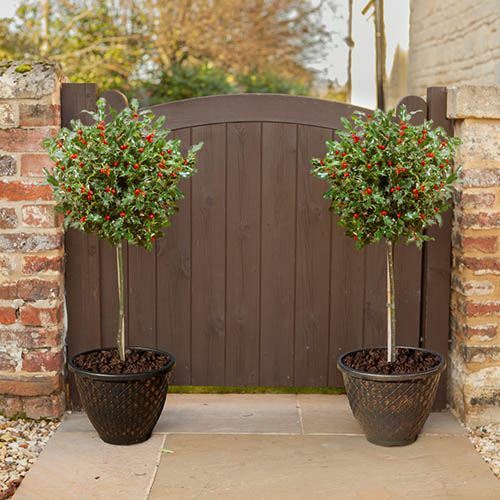 Create stunning festive displays, framing doorways and entrances or adorning patios and conservatories, with this pair of standard Holly Trees. With a slight blush tinge to the beautiful, deep-evergreen, classic holly leaves and rich red berries, they’ll look stunning for many years to come and what’s best is that these holly trees can be enjoyed year-round, not just at Christmas, thanks to their evergreen nature. This new variety is a female (berry producing!) form and is a very prolific berry producer*, so it will bud up and produce masses of rich, red berries in future years. These bushes are slow growing and easy to manage – just one trim a year will keep that perfect lollipop standard tree form. *this female plant will carry berries in autumn and early winter months. Supplied as a a pair of 80cm-100cm tall pot grown Holly Standards, 4 years old, trimmed to a lollipop form head, with a pair of plastic Gold-painted pots 27cm diameter, ideal for potting up into. Remember that birds love holly berries and will eat the berries as they ripen. While many people are happy to feed garden wildlife, you may wish to net your bushes if you want to keep the berries on them. Hollies need almost no maintenance if you keep them well-watered for the first couple of years to enable them to establish. They are more or less trouble-free, with moderately fast growth. The more light that your holly receives, the more leaves it will produce, so plant it where it will get maximum light. To maximize berry production, it is worth investing in a separate, Male holly tree.